Citroen revises C4 range | What Car? 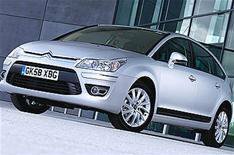 Citroen has face-lifted its C4 range, and has also introduced two new petrol engines. The engines are a 119bhp 1.6-litre unit that averages 42.2mpg and emits 159g/km of CO2, and a turbocharged 149bhp 1.6-litre unit that manages 42.2mph and emits 164g/km of CO2. Both have been engineered by BMW. All diesel models will also be sold with low-rolling-resistance tyres as standard, which slightly improve economy and lower emissions. Styling changes are limited, with the headlights and front bumper design being slightly tweaked, and better cabin materials. Top-spec versions also come with the option of a new sat-nav and audio system. Prices start from 12,695, but generous discounts are likely if you haggle hard.